Extracts from many sources covers the school's history from 1550 onwards. This page needs improving. It does not cite many references or sources. Please help improve this page by adding citations to reliable sources. Please help by correcting or adding material, use the facebook group to do this. Parts annotated thus (?) are uncertain or may need changing. If we can confirm all the facts I shall submit it as a Wikipedia article. 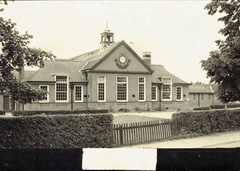 The charity school was erected first at Palgrave, in Suffolk, in 1711, and two years after removed hither. Mr. Briars, rector of Diss, preached a sermon, which was published at the first meeting of the gentlemen and clergy for encouraging this school, which he dedicated to Charles Bishop of Norwich, (whose chaplain he was,) in which it appears that the rector of Palgrave began it, at whose request that parish set apart a large room belonging to the town for that purpose, and subscribed with him 10l. per annum for its maintenance, the neighbouring gentlemen and clergy had then subscribed between 20 and 30l. besides casual gifts, which then came to about 12l. The school was opened the January before. Ten boys of that parish were taught and clothed, six more taught but not clothed. This school is now  kept at Diss, where the master hath his dwelling in part of the late Gild-hall, and keeps his school in another part: there are now  ten boys clothed and taught. The grammar school is kept above, in the same house, where the master hath lodgings, and 10l. per annum; but this is at the voluntary contribution of the parish. It seems the ladies school was never overpopulated, census returns show the pupillage varying from two to as high as seven. This school closed around 1904-08. Was this the reason then why the secondary school was considered†8 (?) ? 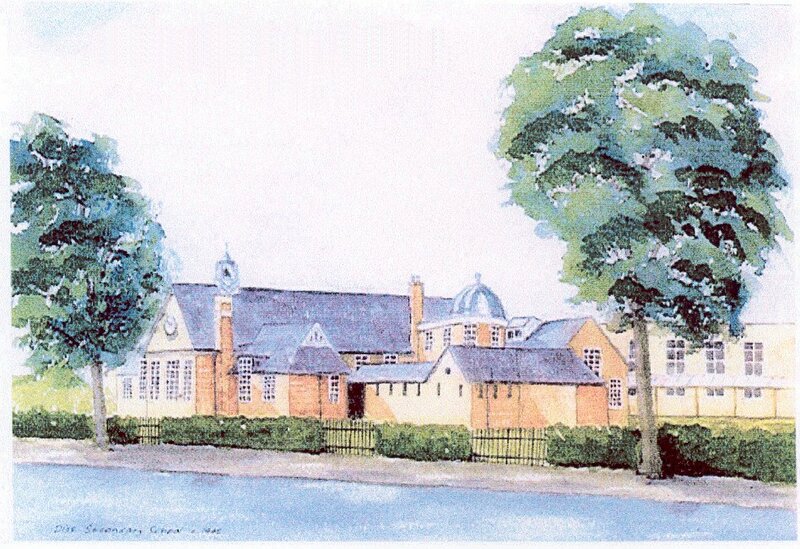 The school was built on land donated by Francis Taylor MP father of Rear Admiral A.H.Taylor †1 (?) in 1908, on the Shelfanger Road, adjacent to Aldrich's brush factory †2. It was called Diss Secondary School. Miss Dixon was the Matron of 'Uplands', a large house in the 1920s on Walcot Road for boarders. 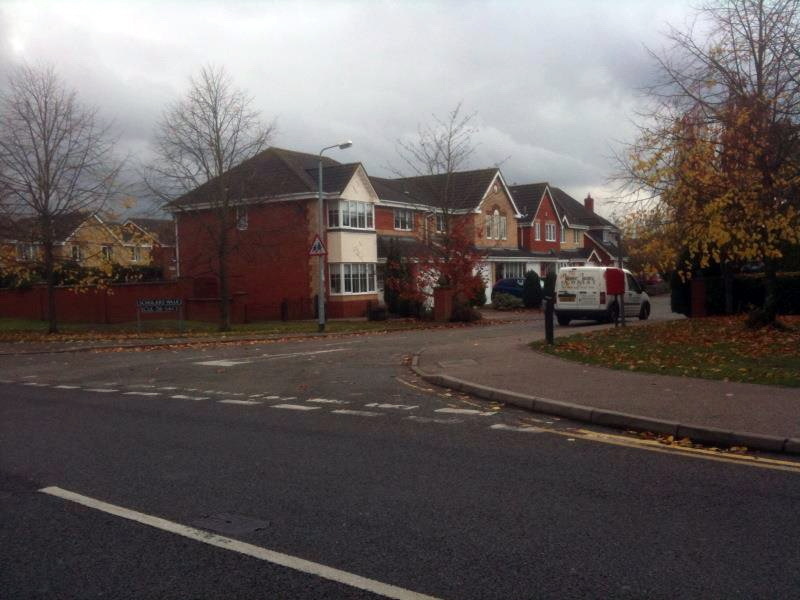 Uplands Way is one of the entrances to Diss High School, the former secondary modern and comprehensive school. 'Uplands' was also used in those days for the domestic science classes †6. The Uplands was a hospital for mentally disturbed German prisoners of war during WWI. 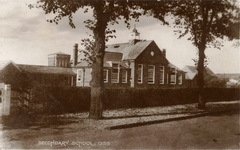 When the school acquired a large field further along Shelfanger Road in the 1930s a lot of work was carried out by boys in the 5th and 6th forms. it was a tremendous task. Poplar saplings were planted around the entire perimeter. A cricket square was marked out, a football pitch was prepared and a wooden cricket pavilion constructed with the help of the woodwork master. The grassy area near the school buildings was reserved for hockey and the annual sports day †3. In 1936 there were just over 200 pupils. 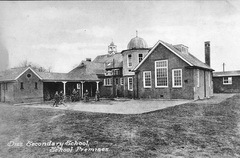 The school was co-educational and some pupils paid fees. Most of the intake came from the Church School or Council School(?). 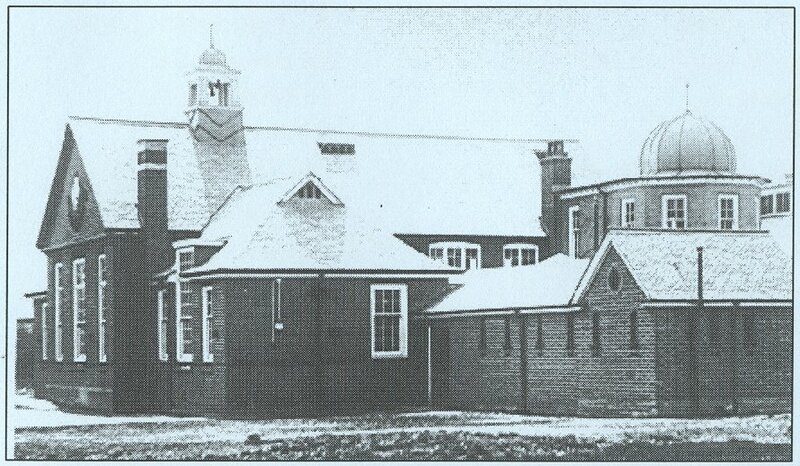 Uplands in 1939 was used for schooling of evacuees †4, 8-11 year olds from Edmunton and Gravesend. Later on it was used as a nursing home for WWII injured personnel (?) and an anti aircraft battery during (?). In 1941 due to the influx of wartime evacuees to the area from larger cities and coastal ports the school had for the first time 2 forms for each year †5. 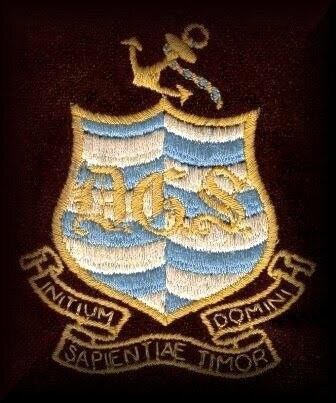 In 1946/47 post The 1944 Education Act the school changed its name from Diss Secondary School to Diss Grammar School †13. In 1949 hardcourts were established between the tennis courts and the canteen. Uplands in the 1950s was converted into flats†9 for teachers at the Secondary Modern School that was constructed during 1954 and 1955 †14. 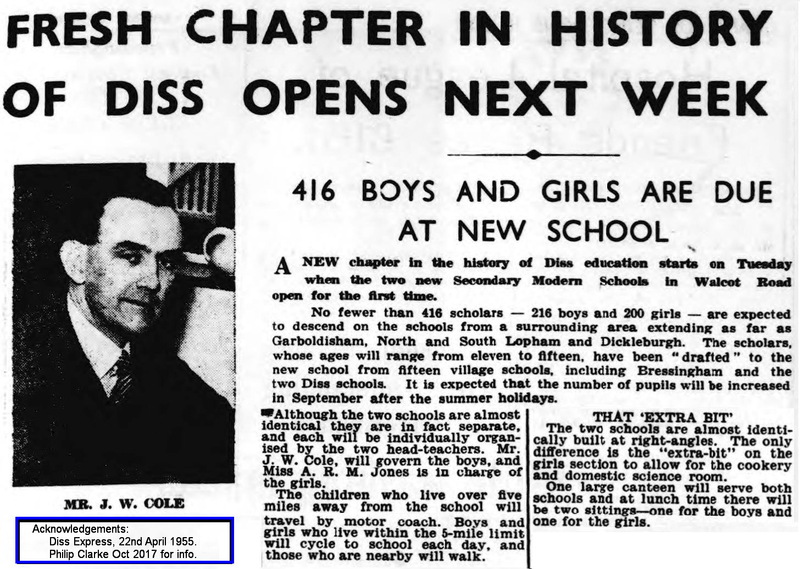 The boys and girls schools both opened on Tuesday, 26th April 1955. In 1953 a new classromm was added above the boiler (furnace) room and in 1954 a new laboraory block was built adjacent to the tennis courts. In the early 1960s there were still about 200 pupils but in 1965, with the closure of Eye Grammar School the number rose to 350(citation needed ?). Not all Eye pupils came to Diss some went to Stowmarket. 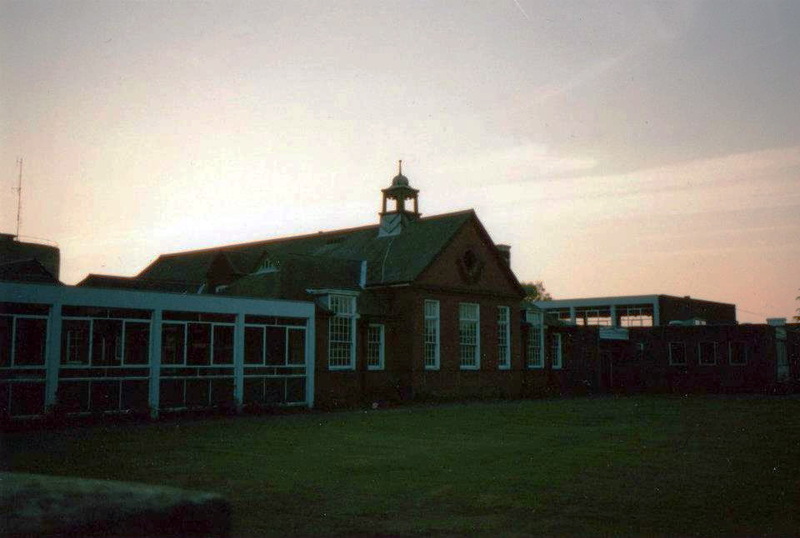 A major extension to the school was built, covering the well-loved grassy area and adding another two storey block and a covered walkway to the original Victorian style group of buildings. A new grassy area to the south of the school was purchased †11(?) and this led to an escalation in detentions for boys: 'stone picking '†6. When the comprehensive school was formed, the grammar school became an anachronism, fell into disuse and was finally pulled down to make way for 'up market' housing †10. 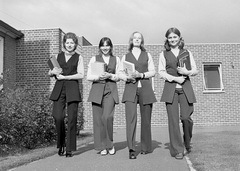 In the 1980/81 school year pupils and teachers started to transfer to the now-renamed Diss High School or to the Sixth Form College both in Walcot Road. 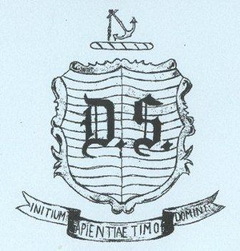 DHS operated on both sites for existing pupils and the new 1st years were the DHS proper. The old DGS buildings were called 'Taylor Hall' for this short period. According to current anecdotal information the merger was not easy †12. DSS / DGS survived for 70 years. 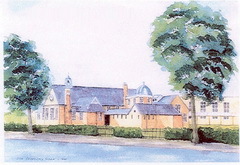 Plans to turn the building into a community centre came to nothing and it was demolished in 1991. 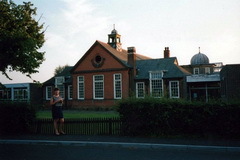 Amazingly the Eye Grammar School buildings still survives as the town's primary school. †1 - Rear Admiral A.H.Taylor CB OBE OStJ DL JP (b1886 d1972) was named on the speech day programme as Chairman in 1963. His sons were Commander P.H. B.Taylor OBE DL (b1916 d1989), J. M. B. Taylor (b1927) and Reverend Canon Ronald Enfield Bisset TAYLOR (b1929 d2009). †2 - Aldrich's brush factory - remember that whistle. †3 - Louis Carr DGS 1929-35, The Old Dyssean, Issue 21, Jul 2011 , Pg 6. †4 - George Tilby, The Old Dyssean, Issue 2, July 2001, Pg 2. 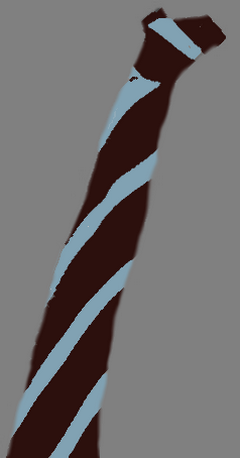 †5 - Kath Bass nee Pipe. †6 - Seth Reeder DGS 1962-67. †7 - Majorie Watts DGS 1921-21, The Old Dyssean, Issue 3, Jan 2002, Pg 14. †8 - The Old Dyssean, Issue 6, Aug 2003, Pg 3. †9 - Sally Lee (nee Pollard) DGS 1969-76, lived there in the 1950s. 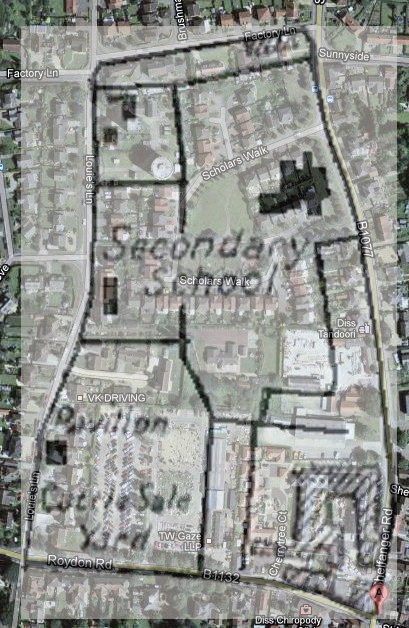 †11 - This may have already still have been owned by the education authority, see 1950 overlay map below. †12 - See Facebook group - 'Diss Grammar School'. †13 - The Annual Speech Day programmes for 1946/47 reflect this change. (Click on images to view). †14 - Diss Express, 22nd April 1955. (Click on image to view). laid over the Google Map 2011. If anyone has an old map of the area to verify this please contact the Webmaster. 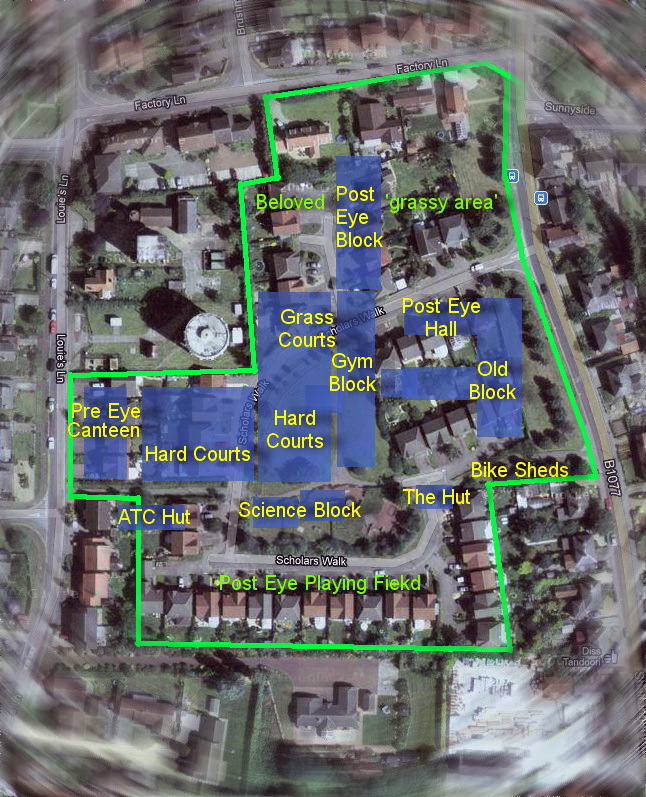 The map opposite attempts to show crudely the outline of the school grounds in green and the buildings in blue, just before closure. The land to the north and east of the water towers was the original 'well loved grassy area'. This was needed for the school extension to cater for the Eye Grammar School merger in 1965. More land was acquired to the south of the lab blocks to replace the lost grassy area. 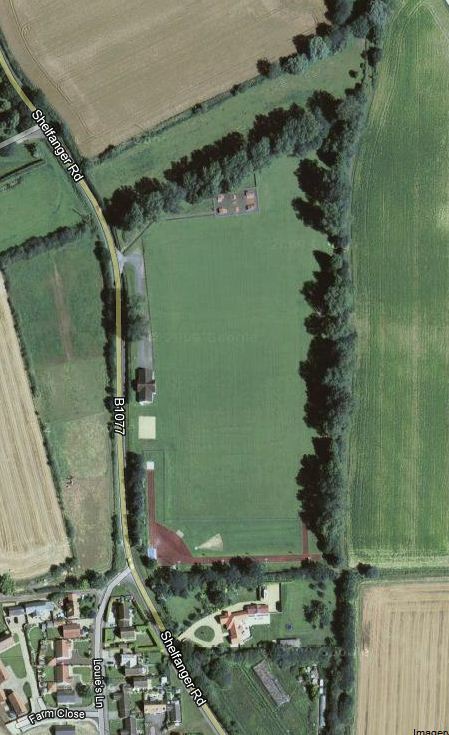 This is a map of the playing field to the north of the school along Shelfanger Road ca.2011. Louis Carr in his memories (see above) refers to the boys building a wooden pavilion. I suspect that pavilion was still there in the 1960s(? ), I can remember a green wooden building. The pavilion shown opposite looks much more substantial. The hard patch to its south could be the site of the original(?). The playing field was used for athletics, hockey, cricket, football, softball, rounders and occasionally touch rugby never rugby(?). Boys who were excused games because of: injury, punishment or a note from your mum, you probably spent countless boring, cold, hours rolling the cricket pitch, with Reggie blowing his whistle and bellowing from afar 'Don't dig your heels in boy!" or stone-picking. Girls played table tennis in the old canteen building. 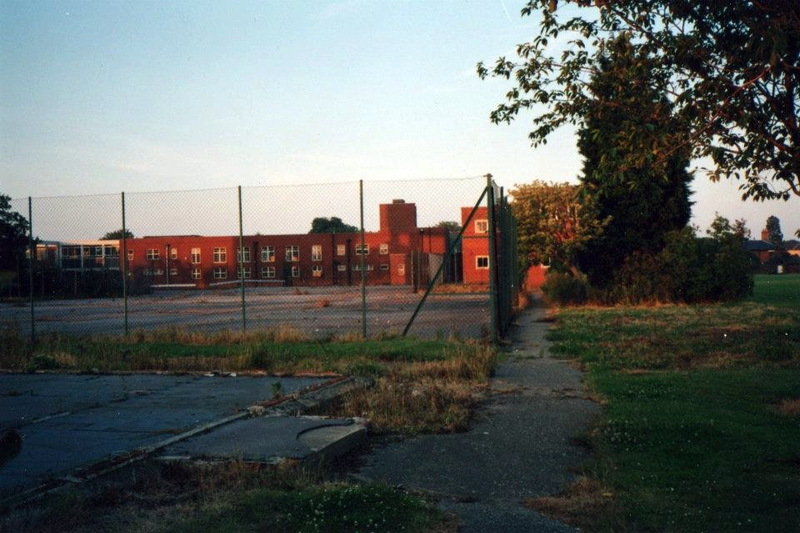 Tennis and basketball were reserved for grass and hard courts in the school grounds. Acknowledgements given in main gallery where known. There is a 5 minute video of the school in our Film Theatre taken just before it was demolished in the 1990s.